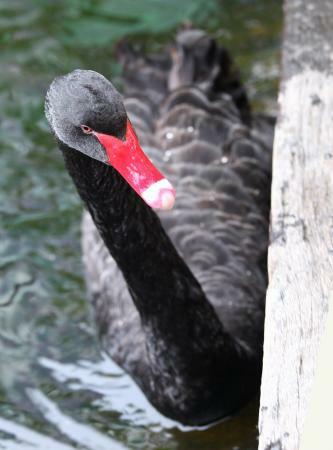 Today, December 23rd, we show you Black Swans that have not been featured in detail on this weblog. 12월23일 오늘은 지금껏 제대로 소개해본적 없는 흑조를 소개드리겠습니다. 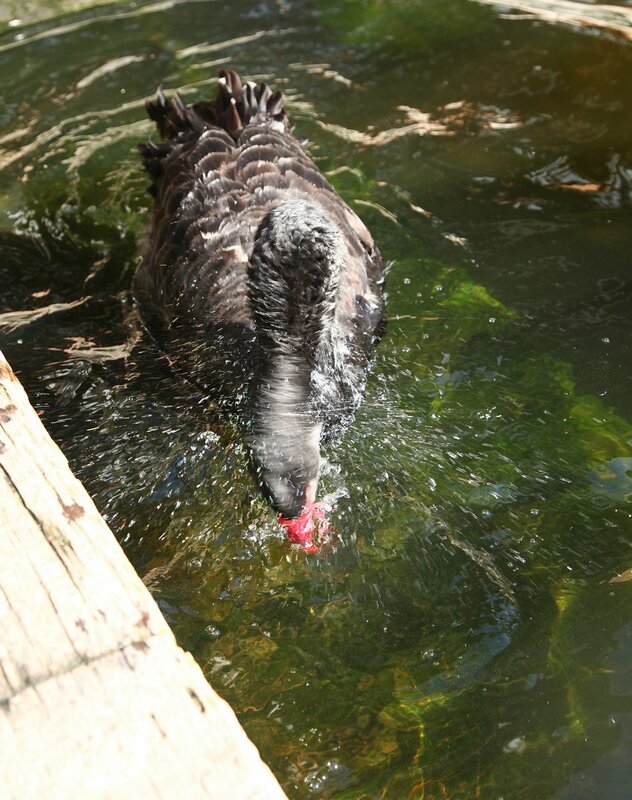 The Garden keeps five Black Swans in total, one in the Waterfowl Pool and other four in the Outdoor Pond. 당원에는 물새못에 한마리,그리고 실외의 못에 4마리,합계 5마리의 흑조가 있습니다. 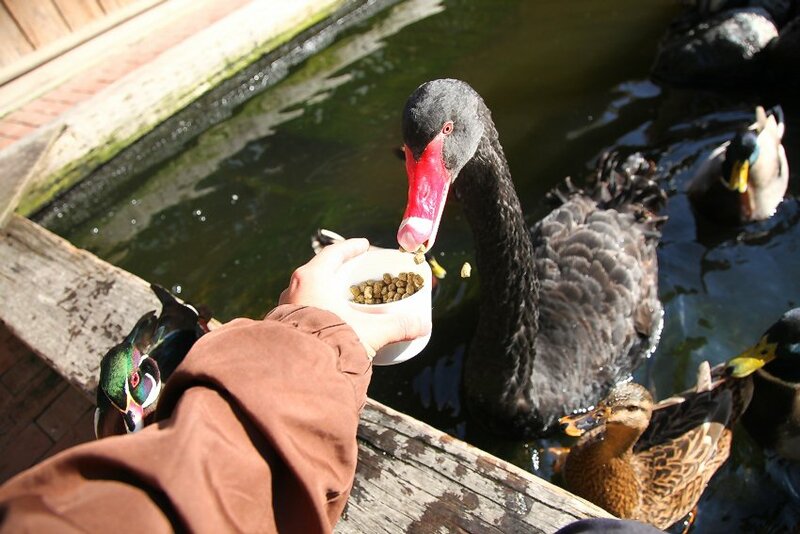 Black Swan(Cygnus atratus) is native to Australia and New Zealand, designated in 1973 as the emblem bird of Western Australia. It mainly feeds on aquatic plants and seeds. It has red bill with white dots near its apex, and its iris is also red. Its body is all black except white outer surface of first and second flight feathers. It is introduced in some ponds in the parks in Japan. 흑조(Cygnus atratus)는 오스트랄리아,뉴질란드원산으로서 1973년에 서오스트랄리아주의 새로 지정되였습니다.주로 수초나 식물의 씨를 먹습니다.성조는 신장이 110cm부터 140cm정도,체중은 5kg부터 6kg사이,최대로9kg까지 달한다고 합니다.주둥이는 빨갛고 끝에 흰점이 있으며 눈은 빨간색입니다.깃털은 전신이 까만색인데 첫번째층과 두번째층의 깃털의 바깥쪽이 흰색입니다.일본에서는 기르는 새로 공원의 못 등에 있는것을 볼수 있습니다. All the Black Swans in the Garden are so tame that you can feed them as you can see in this picture. They are rather greedy, eating up a cup of food in an instant. 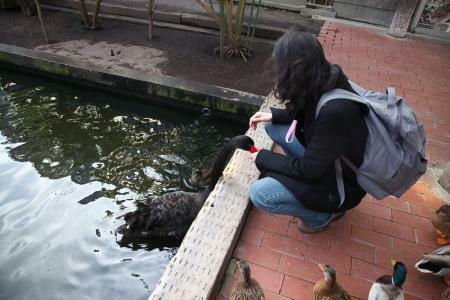 It's quite fun to see them scramble with ducks for food that is scattered on the water. 5마리 모두가 사람에게 습관이 되여 사진처럼 먹이를 먹일수가 있습니다.먹세가 좀 세서 한컵정도는 게눈감추듯 인츰 먹어버립니다.못안에 뿌려주면 오리들한데 빼앗기지 않으려고 열심히 먹고 있는 모습이 참 재밌습니다. After they are well fed, they start bathing. 배불리 먹고 난 후에는 수영하는 시간입니다. Let's hear their voice. Quite cute, isn't it? When one starts crying, others react and keep crying a while. Sometimes you can hear higher whistling, though it is not detected in this video clip. 이번엔 흑조의 우는 소리를 들려드리겠습니다.겉모습과는 달리 목소리가 아주 귀엽습니다.한번 울기 시작하면 다른 흑조들도 연이어서 한참동안 같이 울게 됩니다.이 동영상으로는 안 들리지만 높은 톤으로 <삐잇~>하고 울때도 있습니다. Black Swan has unisexual appearance. Whereas almost only female of other species of swans sit on their eggs, both male and female siton their eggs by turns. 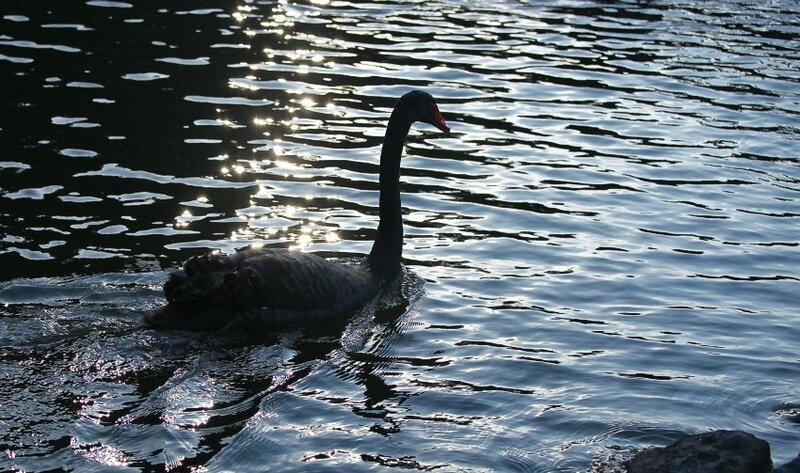 Simlar to other swans and geese, a pair of Black Swan carries on for years. 수컷고 암컷의 겉모습이 비슷하여 그냥은 알아볼수 없습니다.대부분의 백조종류는 암컷이 알을 품는데 비하여 흑조는 수컷이 암컷과 교차하면서 알을 품습니다.다른 백조류나 기러기류도 마찬가지인데 흑조도 커플이 한번 생기면 몇년동안도 오래 지속된다고 합니다. A shot of graceful swimming in the Outdoor Pond. The ones in the Garden are somewhat timid, they are extremely nervous about Mute Swans. They tend to swim at the innermost corner of the pond where Mute Swans are absent. 마지막으로는 외못에서의 우아한 모습입니다.당원의 흑조들은 모두 담이 좀 작은건지 백조에 속하는 혹고니를 많이 무서워합니다.그래서 늘 혹고니가 없는 안쪽에서 조용히 놀고 있습니다.